Arkham’s unlikely heroes have a new weapon in the ongoing fight to keep their streets safe. 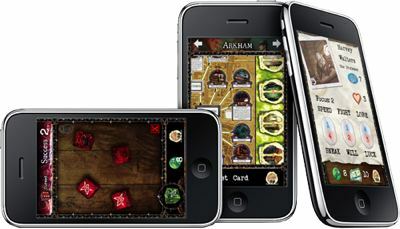 Fantasy Flight Games is proud to announce that the Arkham Horror Toolkit, a convenient digital accessory for the popular Arkham Horror board game, is now available on the iTunes App Store. A Range of Functions The Arkham Horror Toolkit is a full suite of tools designed to augment and enhance your Arkham Horror experience. Whether you use the Investigator tool, Dice Roller, Location Deck, Map Display, or all of the above, the Arkham Horror Toolkit will take care of the bookkeeping for you. This wide range of time-saving functions will let you concentrate on what’s most important: ridding Arkham of the dark forces that seek to overtake it. With the Investigators tool, all the information pertinent to your character is at your fingertips. Choose from any of the base game characters (or those from any expansions you’ve added), or let the Arkham Horror Toolkit select one randomly for you. Then, you can monitor and adjust important stats like Sanity, Health, Money, Clue Tokens, or any of your Skills. You can also quickly access your character’s starting location, possessions, and backstory.